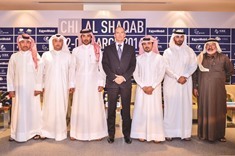 Qatar Olympic Committee President HE Sheikh Joaan bin Hamad al-Thani (third from left) presents the trophies to the winners of the CHI Al Shaqab Grand Prix at the Al Shaqab Arena yesterday. 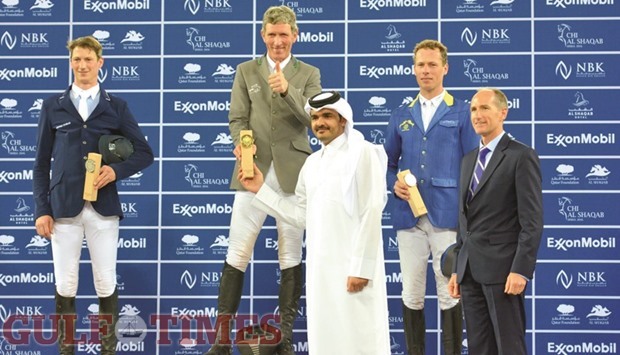 Germany’s Ludger Beerbaum won the title, his second in Doha after 2014, followed by compatriots Daniel Deusser and Christian Ahlmann. Germany’s Ludger Beerbaum won his second CHI Al Shaqab Grand Prix title last night, riding his trusted 13-year-old Grey Mare Chiara to another triumph. The four-time Olympic gold medallist (thrice team and once individual champion) clinched the CSI5* Grand Prix Two Rounds with Jump Off 1.60m on the concluding night of the event at the magnificent Al Shaqab arena. The 52-year-old Beerbaum led the German sweep on the podium, with his compatriots Daniel Deusser on First Class van Eeckelghem and Christian Ahlmann on Codex One coming second and third respectively. Beerbaum called it a ‘special feeling’ after beating a ‘strong field’ to take the crown. “The way she jumped was really nice. I went last and that was definitely was an advantage. I am very pleased because I beat a strong field. To come back and sit here is a special feeling,” Beerbaum said. “My horse came from a two-month break. To come back like this, so clear, is a great feeling. 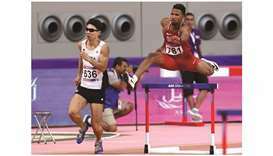 It is a special feeling,” Beerbaum added. Beerbaum set the track for 42 competitors that qualified during the week to compete for the mega event. Twenty riders then qualified for the second round with Beerbaum, Deusser, Ahlmann, Luciana Diniz and Nicola Philippaerts jumping clear to advance to the jump-off. Beerbaum was the last to go in the jump-off, as he had to clear Deusser’s time of 49.02 seconds, and the veteran rider used all his experience to scoop another win in Doha. 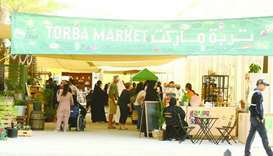 It was the sixth show for Chiara in Doha. Berbaum earlier had finished second in the Global Champions Tour final at the same venue in 2014 before a third place in the Grand Prix at Chi Al Shaqab 2013. The Global Champions Tour and last week’s HH The Emir’s Sword winner Luciana Diniz riding her champion Mare, Fit for Run 13 had to settle for fourth place. In fact, at one point Diniz looked to top the table but she committed a fault, which proved costly for the Portuguese. 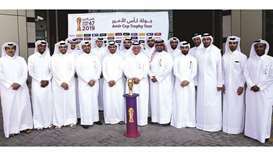 Qatar’s Sheikh Ali bin Khalid al-Thani riding his Stallion Imperio Egipcio Milton finished 21st, while Khalid Mohamed A S al-Emadi (Tamira IV) and Ali Yousef al-Rumaihi (Gunder) came 28th and 29th respectively. Bassem Hassan Mohamed riding California finished 33rd. Sweden’s Patrik Kittel and his 12-year-old Mare, Deja claimed the top spot in the Grand Prix Freestyle to Music at the CHI Al Shaqab last night. At the Al Shaqab arena, Kittel and Deja combined to score 82.55% to clinch the Dressage title and pocket €25,000. The Swede was favourite going into the event, as he had won on Friday and also in the preceding CDI5* GP - Grand Prix. Kittel and Deja lived up to that billing. The pair’s beautiful Freestyle routine was rewarded as Kittel achieved the horse’s best ever score. “It’s a special horse,” a delighted Kittel said after the victory. “She (Deja) was fantastic today. The music just fitted into our rhythm today. The mare that we have these days are really good. I couldn’t be happier,” he added. “Today the presentation was done at the main arena and I was like ‘wow’. What really clicked was the music and how everything turned out,” the Swede said. Irish rider Judy Reynolds set a score of 79.700% on her way to a runner-up finish on Vancouver K. Reynolds and the gelding had previously set an Irish record of 77.425% at Lyon in France last October. The third place went to Germany’s Jessica von Bredow-Werndl, who with Zaire aggregated 79.475 points. 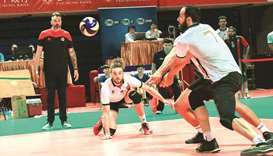 The second place went to Egypt’s Saed Saad (Triple S) and the third to Saudi’s Ramzy Hamad al-Duhami (Bayard van de Villa Theresia).